This is true: For God so loved the world that He gave his only begotten Son, that whoever believes in Him shall not perish but have everlasting life. – Daniel Berrigan, Testimony: The Word Made Flesh (Orbis Books, 2004). This is sooo good! Good to speak to a perceived loss of Hope or support for humanity here and around the world! Thank you very much, Mike. Advent blessings to you Jan and your family. Once again Fr. Mike you hit it right on by highlighting some of the writings of Fr. Daniel. His story could be a movie. Wishing you a Happy Advent! Thanks Deacon John. Fr. Daniel offers us some much needed wisdom and courage. Thank you for this. Sharing with our lay Episcopal community (we also enjoyed sharing your sermon for yesterday’s Gospel at our service last night). Shannon, may the hope and expectation of Advent lead you and your community to the joy of Christmas. Thanks for your comment and for reading my blog. I needed to remember all of this! Thank you so much for posting this. I’m glad it was helpful. I need reminding too. The webbing of the screen? Through the room to sing silence into prayer. As the pulse of life pumps mystery. Thanks Mark, for these images and for making Fr. 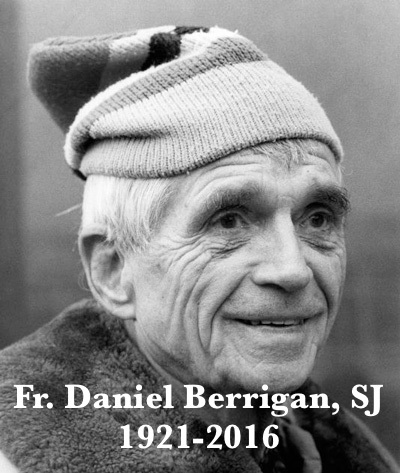 Berrigan a bit more present. “To sing silence into prayer” – I will carry that one with me. Thank you.